Eklöws Röda är en överjäst röd ale. Finns på lokala krogar och på Bålstas Systembolag! Den går också att beställa via beställningssortimentet (även enstaka flaskor). 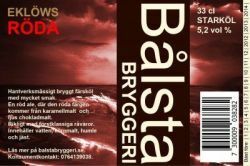 Sök på "Bålsta" eller använd länken http://www.systembolaget.se/89523. Det är ett hantverksmässigt bryggt färsköl med mycket smak, rikligt med förstklassiga råvaror. Den röda färgen kommer från två sorters karamellmalt (Crystal och Dark Crystal) och ljus chokladmalt. Basmalt Maris Otter. Kryddad med humlesorterna Cascade och East Kent Golding. 330ml bottle from Systembolaget, Kungsängen. Hazy amber with a frothy egg-white head, a lot of lacing around the glass. Sweet toffee malty aroma, sugar and caramel. Mild carbonated, soft, mid-sweet and rounded mouthfeel. Malty taste, butterscotch, bread and hay. Bottle from systembolaget Bålsta. Big white head with big bubbles. Mixed aroma from light caramell malt and vegetable aroma. Very nice malt taste with firm bitterness and fine body. Thin fruit scent. The bitterness takes over the fruity pretty fast and disappears. The aftertaste is still quite long. No impressive beer unfortunately. Also quite dry. Follow me @ Kung av öl @ Facebook for more pictures and ratings. Deep nut brown, amber color, small beige head. Caramel, some bready notes in the aroma. Medium-bodied. Caramel, fruity sweetish with quite good resiny bitterness in the finish. Well-brewed amber ale, good start. Similarities to Beer Hunter’s amber ales. Ar: malty, toffee, caramel, chocolate, earthy hops, perfume, leaves, grapefruit, resin, soft ash, Ap: reddish/copper colour, medium beige head, lacing. F: medium bite, lots of floral hoppiness, malts is prominent, albeit a little light, the aftertaste is a little thin and could be a bit fuller. P: the body feels a little thin, almost watery, small lively bubbles. T: enjoyable beer, with a fuller body it would have been even better. 33 cl bottle from Systembolaget, order by bottle selection. Sampled on March 1, 2013. Clear copper color, white head. Sweet, sugary, some paper scent. Dry, bitter, sandy taste. Warming alcohol. Medium mouthfeel, medium high bitterness. 330 ml bottle. Aroma malty with notes of washing detergent. Taste of caramalt and darker malts, bitterness fairly high. Finish is long and bitter. Bottle at home. Clear amber beer with a small offwhite head. Hoppy, fruity and malty aroma. Hoppy, berries, fruity and malty aroma. Nice hoppy beer with other nice flavours too. Bottle, bought @ Systembolaget, Hyltebruk. Pours nice deep red with a small, staying, creamy, off-white head. Aroma has caramel, red berries, a bit yeasty. Medium carbonation, fairly creamy and light dry mouthfeel. Flavour has caramel, light dusty, red berries. Firm malty bitterness. Lingering dryness. Solid.